I hope everyone's summer is off to a great start! For those of you that don't know me I am the new president of the Music Boosters, taking over from Chris Retterer. Chris did an amazing job and she'll be a tough act to follow. June Booster Meeting - the next meeting is tomorrow night, Tuesday, 6/9 at 7pm in the Band Room. Meetings tend to run 45 minutes to an hour. All are welcome. Band Camp Payments - Emails will be going out to each student/family by the end of June to confirm your remaining balance due at Band Camp check-in. Band camp scholarship amounts will be communicated directly to awarded students at the same time. New Booster Officers - The officers for the upcoming school year were solidified at our last meeting. They are: Chuck and Cindy White (Vice Presidents), Bob Rhoades (Treasurer), and Michelle Fox (Secretary - 2nd year). A huge thank you to our outgoing officers...Chris Retterer (President) and Mark Whatley (Vice President). 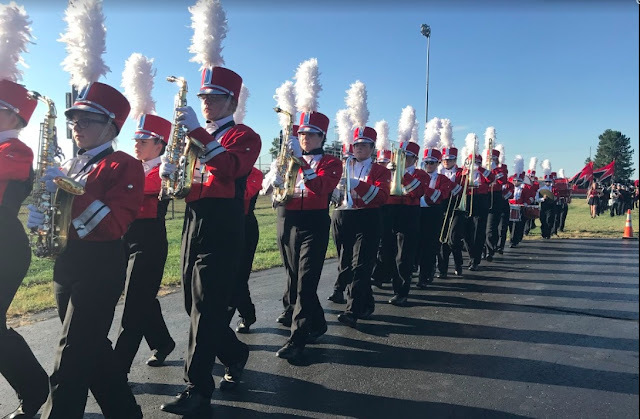 Booster support this past year / what's coming this school year - Before school resumes, I will provide more information on what we do for the music program and what the we're thinking for the upcoming school year. We do a lot of great stuff and there are lots of opportunities to make a difference for Fairbanks. If you have any questions, concerns, please do not hesitate to reach out to me.